Next, we will consider the usage of the most important standard filters. These describe the methods (and options) a filter has and provide code examples showing how to instantiate the filter and apply it to input data. If you need to use a filter not covered in this section, please refer to Standard Filters section of the Zend Framework Reference Manual. In this section, we will consider several filters from the group of filters related to casting input data to the specified type and provide their usage examples. The ToInt filter is a very simple filter that is designed to cast an arbitrary scalar data to an integer. This filter may be useful when adding validation rules for form fields that must contain an integer numeric values (e.g., a drop-down list or a text field containing an amount of something). The ToInt class has the single filter() method. The ToInt filter will not cast a non-scalar value. If you pass it an array, it will return it as is. Below, you can find a code example illustrating the usage of the ToInt filter. // Filter a value casting it to an integer number. $filteredValue = $filter->filter('10'); // Returns (int) 10. $filteredValue2 = $filter->filter(['10', '20']); // Returns array as is. In the code above, we pass the string "10" to the filter (line 6). The expected return value is the integer 10. In line 7, we pass an array to the filter. Because the ToInt filter works with scalar values only, it returns the array as is (without changes) and raises a PHP warning. The Boolean class is a filter that is designed to cast an arbitrary data to a boolean value (true or false). This filter can be used for filtering check box form fields. Its public methods are listed in table 8.3.
filter($value) Returns a boolean representation of $value. getCasting() Returns the casting flag. setType($type) Sets types from which to cast. The filter provides several methods allowing to set filtering options (setCasting(), setType(), and setTranslations()). The setCasting() method allows to choose one of two modes in which the filter may operate. If the flag is true, the filter will behave like the PHP (boolean) cast operator. Otherwise (if the flag is set to false), it will cast only from types defined by the setType() method, and all other values will be returned as is. TYPE_BOOLEAN 1 "boolean" Returns a boolean value as is. TYPE_INTEGER 2 "integer" Converts an integer 0 value to false. TYPE_FLOAT 4 "float" Converts a float 0.0 value to false. TYPE_STRING 8 "string" Converts an empty string '' to false. TYPE_ZERO_STRING 16 "zero" Converts a string containing the single character zero ('0') to false. TYPE_EMPTY_ARRAY 32 "array" Converts an empty array to false. TYPE_NULL 64 "null" Converts a null value to false. TYPE_FALSE_STRING 128 "false" Converts a string containing the word "false" to a boolean false. TYPE_LOCALIZED 256 "localized" Converts a localized string which contains certain word to boolean. TYPE_ALL 511 "all" Converts all above types to boolean. // Call the setType() and pass it a combination of constants. // Call the setType() and pass it an array with literal equivalents. Below, we provide a code example illustrating the usage of the Boolean filter. // Optionally configure the filter. // Filter a value casting it to a boolean number. $filteredValue = $filter->filter('false'); // Returns boolean false. $filteredValue2 = $filter->filter('1'); // Returns boolean true. $filteredValue3 = $filter->filter('false'); // Returns boolean false. $filteredValue4 = $filter->filter('yes'); // Returns boolean true. The ToNull filter is designed to cast an arbitrary data to a null value if it meets specific criteria. This may be useful when you work with a database and want to have a null value instead of any other type. If the value cannot be treated as null, the filter will return the value as is. The ToNull filter's public methods are listed in table 8.5.
filter($value) Casts the $value to null, if possible; otherwise returns values as is. setType($type) Defines from which types to cast. By default, the ToNull filter behaves like PHP's empty() function: if the empty() function returns a boolean true on the input data, then the filter will return the null value on that data, as well. The setType() method can be used to set the type from which the filter will cast to null. This method takes a single parameter, which can either be a combination of TYPE_-prefixed constants listed in table 8.6 or an array of their literal equivalents. TYPE_BOOLEAN 1 "boolean" Converts a boolean false value to null. TYPE_INTEGER 2 "integer" Converts an integer 0 value to null. TYPE_EMPTY_ARRAY 4 "array" Converts an empty array to null. TYPE_STRING 8 "string" Converts an empty string '' to null. TYPE_ZERO_STRING 16 "zero" Converts a string containing the single character zero ('0') to null. TYPE_FLOAT 32 "float" Converts a float 0.0 value to null. TYPE_ALL 63 "all" Converts all above types to null. This is the default behavior. $filteredValue = $filter->filter('0'); // Returns null. $filteredValue2 = $filter->filter('1'); // Returns string '1'. $filteredValue3 = $filter->filter(false); // Returns null. The DateTimeFormatter filter accepts a date in an arbitrary format and converts it into the desired format. This filter can accept a string (e.g., '2014-03-22 15:36'), an integer timestamp (like the time() PHP function returns) or an instance of the DateTime PHP class. The DateTimeFormatter filter may throw a Zend\Filter\Exception\InvalidArgumentException exception if you pass it a date in an incorrect format. Filter's public methods are listed in table 8.7.
filter($value) Transforms the date into the desired format. setFormat($format) Sets the date format. // Set filter's format (optional). // Transform the date to the specified format. // The expected output is 'March 22, 2014 3:36 PM'. In this section, we will consider usage examples of the filters from the group of filters related to manipulating file paths. The BaseName filter class is just a wrapper on the basename() PHP function. It takes a string containing the path to a file or directory and returns the trailing name component. // Filter a file path and return its last part. // The expected filter's output is the 'error.log'. The BaseName filter will not process a non-scalar value. If you pass it an array, it will return the array as is and raise a PHP warning. The Dir filter class is just a wrapper on the dirname() PHP function. It takes a string containing the path to a file or directory and returns the parent directory's path. The Dir filter will not process a non-scalar value. If you pass it an array, it will return the array as is. Below, a code example demonstrating the usage of the Dir filter is provided. // Filter a file path and return its directory name part. // The expected filter's output is the '/var/log/httpd'. The RealPath filter takes an absolute or a relative file path as a string input argument. It expands all symbolic links and resolves references to '/./', '/../' and extra '/' characters in the input path and returns the canonicalized absolute pathname. The RealPath filter is a wrapper over the realpath() PHP function. Filter's public methods are listed in table 8.8.
filter($value) Returns canonicalized absolute pathname. setExists($flag) Specifies if the path must exist for this filter to succeed. The value true means the path must exist; the value false means a nonexisting path can be given. getExists() Returns true if the filtered path must exist. The RealPath filter returns a boolean false on failure, e.g., if the file does not exist. If a nonexisting path is allowed, you can call the setExists() method with the false parameter. Below, a code example demonstrating the usage of the RealPath filter is provided. // The expected filter's output is the '/var/log/httpd/error.log'. The RealPath filter will not process a non-scalar value. If you pass it an array, it will return the array as is. In this section, we will consider several filters from the group of filters related to compressing and encrypting the input data. These filters are not very usable for filtering form data but can be used outside of forms with a great success. The Compress filter is designed to compress input data with some compression algorithm. For example, you can use this filter to compress the data and save it as an archive file. Filter's public methods are listed in table 8.9.
filter($value) Performs data compression using the specified algorithm. getAdapter() Returns the current adapter, instantiating it if necessary. getOptions($option) Gets individual or all options from underlying adapter. The Compress filter itself cannot compress data. Instead, it uses a so-called adapter class. The adapter class must implement the CompressionAlgorithmInterface interface. You attach an adapter to the Compress filter, and the adapter implements the concrete compression algorithm. There are several standard adapter classes available (see figure 8.2 and table 8.10 below). Those classes live in the Zend\Filter\Compress namespace. 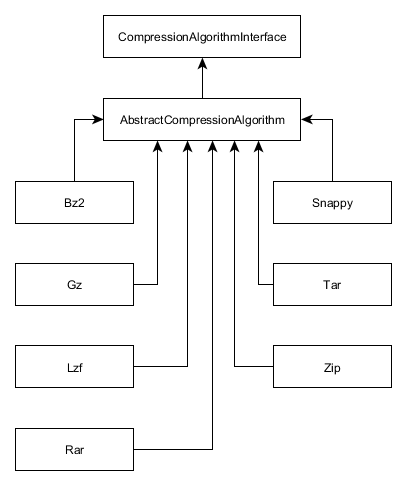 Bz2 Bzip2 (Burrows–Wheeler) compression algorithm. Gz Gzip compression algorithm is based on the Deflate algorithm, which is a combination of LZ77 and Huffman coding. Zip ZIP is a compression algorithm widely used in Windows operating system. Tar Tarball file format is now commonly used to collect many files into one larger file for archiving while preserving file system information such as user and group permissions, dates, and directory structures. Widely used in Linux operating system. Lzf LZF is a very fast compression algorithm, ideal for saving space with only slight speed cost. Snappy Snappy is a fast data compression and decompression library developed by Google based on ideas from LZ77. Rar RAR is an archive file format that supports data compression, error recovery, and file spanning. Below, a code example demonstrating the usage of the Compress filter is provided. // file in the current working directory. In the code above, we create the instance of the Compress filter (line 3), set its adapter (line 6), set adapter's options (line 7), and finally, compress the input file (line 13). The expected result, the example.zip archive file, will be created in the current directory. The archive will contain the testfile.txt file. The Decompress filter is a "mirror reflection" of the Compress filter and can be used by analogy. By that reason, we do not cover the Decompress filter in this section. The Encrypt filter's purpose is encrypting the input data with the specified algorithm. Filter's public methods are listed in table 8.11.
filter($value) Performs data encrypting using the specified algorithm. The Encrypt filter uses adapter classes to perform actual data encryption. You attach an adapter to the Encrypt filter with the setAdapter() method, and the adapter performs the concrete encryption. An adapter class must implement the EncryptionAlgorithmInterface interface. There are several standard adapter classes available (see figure 8.3 below). Those classes live in the Zend\Filter\Encrypt namespace. BlockCipher -- implements symmetric block cipher algorithm. Openssl -- uses an encryption algorithm from the OpenSSL library. Below, a code example demonstrating the usage of the Encrypt filter is provided. // Encrypt an input data. The expected result is a string encrypted with the block cipher. The Decrypt filter is a "mirror reflection" of the Encrypt filter and can be used by analogy. By that reason, we do not cover the Decrypt filter in this section. In this section, we will consider usage examples of the filters from the group of filters related to manipulating string data. The StringToLower filter class is designed for converting the input string data to lowercase letters. The public methods of the filter are provided in table 8.12 below. filter($value) Converts the string to lowercase letters. setEncoding($encoding) Sets the input encoding for the given string. By default, the filter behaves like the strtolower() PHP function. Given a string, it returns the string with all alphabetic characters converted to lowercase. The "alphabetic characters" are determined by the system locale. This means that in, for example, the default "C" locale, characters such as umlaut-A (Ä) will not be converted. Calling the setEncoding() method on the filter and passing it an encoding to use forces this filter to behave like the mb_strtolower() PHP function. By contrast to strtolower(), "alphabetic" is determined by the Unicode character properties. Thus, the behavior of this function is not affected by locale settings, and it can convert any characters that have 'alphabetic' property, such as A-umlaut (Ä). If the value provided is non-scalar, the value will remain unfiltered, and an E_USER_WARNING will be raised indicating it cannot be filtered. // (Optionally) set encoding on the filter. // The expected filter's output is the 'how to start a business in 10 days'. The StringToUpper filter (converting a string to uppercase letters) is a "mirror reflection" of the StringToLower filter and can be used by analogy. By that reason, we do not cover the StringToUpper filter in this section. The PregReplace filter can be used for performing a regular expression search and replace in a string data. This filter is a wrapper over the preg_replace() PHP function. The public methods of the filter are provided in table 8.13 below. filter($value) Performs a regular expression search and replace. setPattern($pattern) Sets the pattern to search for. It can be either a string or an array with strings. setReplacement($replacement) Sets the string or an array with strings to replace. getReplacement() Gets currently set replacement value. The StripTags filter removes all tags (e.g. <!-- -->, <p>, <h1> or <?php ?>) from the input string. It allows to explicitly define the tags which should not be stripped out. Additionally, it provides an ability to specify which attributes are allowed across all allowed tags and/or specific tags only. Public methods of the StripTags filter are listed in table 8.14.
filter($value) Returns the value with tags stripped off it. getAttributesAllowed() Returns the list of attributes allowed for the tags. setAttributesAllowed($attributesAllowed) Sets the list of attributes allowed for the tags. getTagsAllowed() Returns the list of tags allowed. setTagsAllowed($tagsAllowed) Sets the list of tags allowed. The StripTags will not process a non-scalar value. If the value passed to the filter is non-scalar, the value will remain unfiltered. The StripNewlines filter is a very simple filter which returns the input string without any newline control characters ("\r", "\n"). // The expected filter's output is the 'A multi line string'. The StripNewlines will not process a non-scalar value. If the value passed to the filter is non-scalar, the value will remain unfiltered. The UriNormalize filter can be used for normalizing a URL string and (optionally) applying a scheme part to it. The public methods of the filter are provided in table 8.15 below. filter($value) Filter the URL by normalizing it and applying a default scheme if set. setDefaultScheme($defaultScheme) Set the default scheme to use when parsing schemeless URIs. setEnforcedScheme($enforcedScheme) Set a URI scheme to enforce on schemeless URIs. The URL string is decomposed into its schema, host, port number, path, and query parts. If the scheme part is missing from the original URL, the default scheme is used. The scheme and host parts are converted to lowercase letters. The port number is checked against the list of allowed port numbers, and if it doesn't belong to the list, the port number is cleared. The path part of the URL is filtered, removing redundant dot segments, URL-decoding any over-encoded characters, and URL-encoding everything that needs to be encoded and is not. The query part is sanitized, URL-decoding everything that doesn't need to be encoded and URL-encoding everything else. The URL normalization procedure rules may be different for different protocols (schemes). If the URL doesn't contain the scheme part, the http scheme is assumed by default. You may use the UriNormalize filter's setDefaultScheme() method to set the default scheme for URL normalization. It accepts any of the following schemes: http, https, file, mailto, urn, and tag. Additionally, the UriNormalize filter's setEnforcedScheme() allows to override the default scheme part by the so-called "enforced scheme", if the original URL doesn't contain scheme part. // Filter an URL string. // The expected filter's output is the 'https://www.example.com/'. Filters can be organized in a sequence. This is accomplished by the FilterChain class. When such a compound filter is run, the value filtered by the first filter is passed as an input for the second one, and then the value filtered by the second filter will be passed to the third one, and so on. The FilterChain class is internally used by the InputFilter container class for storing the sequence of filters attached to the form model's field. filter($value) Returns value filtered through each filter in the chain. Filters are run in the order in which they were added to the chain (FIFO). attach($callback, $priority) Attaches an existing filter instance (or a callback function) to the chain. attachByName($name, $options, $priority) Instantiates the filter by class name or alias and inserts it into the chain. merge($filterChain) Merges the filter chain with another filter chain. getFilters() Returns all the attached filters. count() Returns the count of attached filters. An example filter chain is shown in figure 8.4. It consists of the StringTrim filter followed by the StripTags filter, which is then followed by the StripNewlines filter. // Instantiate the filter chain. // Insert filters into filter chain. // Execute all filters in the chain. // The expected output is 'name@example.com'. In the code above, we instantiate the FilterChain filter with the new operator (line 5). In line 8, we set construct the chain of filters with the setOptions() method. "priority" is the optional key which defines the priority of the filter in the chain. Filters with higher priority are visited first. The default value for the priority is DEFAULT_PRIORITY. Finally, in line 28, we call the filter() method, which walks through the chain and passes the filtered value to each filter in turn. Standard filters are designed to be used in frequently appearing situations. For example, you may often need to trim a string or convert it to lowercase. However, sometimes there are cases where you cannot use a standard filter. Here, the Callback filter will be handy. The Callback filter is designed as a wrapper for your custom filtering algorithm. For example, this may be useful when a standard filter is not suitable, and you need to apply your own filtering algorithm to the data. You implement your custom filtering algorithm as a callback function or a callback class method. A callback is a function or a public method of a class which is called by the Callback filter and is passed the value to be filtered and, optionally, user-defined argument(s). The public methods provided by the Callback filter are listed in table 8.17.
filter($value) Executes a callback function as a filter. setCallbackParams($params) Sets parameters for the callback. getCallbackParams() Gets parameters for the callback. As you can see from the table, the Callback filter provides the setCallback() and setCallbackParams() methods that can be used to set the callback function (or the callback class method) and, optionally, pass it one or several parameters. To demonstrate the usage of the Callback filter, let's add the phone number field to our ContactForm form model class and attach a custom filter to it. An international phone number typically looks like "1 (808) 456-7890". It consists of the country code followed by the three-digit area code enclosed into braces. The rest of the phone consists of the seven-digit subscriber code divided in two groups separated by a dash. The country code, the area code, and the subscriber code are separated by the space character. We will refer to this phone format as the "international" format. The international phone format is required for making telephone calls between different countries (or areas). If the calls are made within the same area, the telephone number may simply look like "456-7890" (we just omit the country code and area code). We will refer to this phone format as the "local" phone format. To make our filter as generic as possible, we assume that the user is required to enter the phone in international format for some forms and in local format for other forms. Because some site visitors may enter their phone number in a format different from what is required, we want to apply the filter that will "normalize" the phone number for us. Strip out any non-numeric characters of the input value. Pad the digits to the required length if there are too few digits. Add the braces, the spaces, and the dash (when using the international format); or simply add the dash (when using the local format). // Custom filter for a phone number. // Return non-scalar value unfiltered. // Return empty value unfiltered. // First, remove any non-digit character. // Pad with zeros if the number of digits is incorrect. // Add the braces, the spaces, and the dash. $phoneNumber = substr($digits, 0, 1) . ' ('. substr($digits, 1, 3) . ') ' . substr($digits, 4, 3) . '-'. In lines 11-20 of the code above, we add the "phone" field to the ContactForm form model. The field is a usual text input field, and we already had some experience of working with such fields earlier. Then, in lines 26-40, we add a validation rule for the "phone" field of our form. Under the "filters" key (line 29), we register the Callback filter (here, we use the short alias Callback, but you can alternatively use the fully qualified class name Callback::class). The filter takes two options (line 32): the "callback" option and the "callback_params" option. The "callback" option is an array consisting of two elements, which represent the class and the method to call, respectively. In this example, the callback is the filterPhone() method of the ContactForm class. We pass the "format" parameter to the callback method with the help of "callbackParams" option (line 34). In lines 44-79, we define the filterPhone() callback method, which takes two arguments: the $value is the phone number to filter, and the $format is the desired phone number format. The $format parameter may either be 'local' (for local format) or 'intl' (for international format). First, in line 46, we check if the $value parameter is a scalar and not an array. If the value is not a scalar, we return it without change. In line 53, we check the input value's length. We do nothing if the user entered an empty phone number; we just return it as is. Then, we remove any non-digit characters (line 59). If phone length is too short, we pad it with zeroes. We add the braces, the dash, and the spaces for international phone numbers; or just the dash for local phone numbers. Finally, we return the resulting phone number. To see how this filter works, you can open the "http://localhost/contactus" URL in your web browser. If you enter some phone number in an incorrect format, the filter will fix the phone number and transform it to the desired format.